The Morni Hills is a beautiful tourist attraction in the state of Haryana, India. It is located in the district of Panchkula and is about 45 km away from Chandigarh, the capital city of the state. Morni Hills is a part of Himalayan Shivalik range. 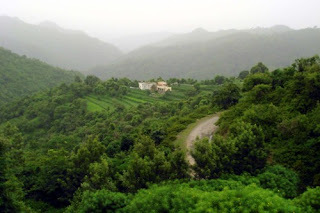 There is a tiny village named ‘Morni’ situated in Morni Hills. It is an ideal place to spend holiday. It is abundant with beautiful landscape, lakes and many other scenic spots. Morni Hills is gifted with beautiful natural surroundings. It is home to about 450 species of birds like Crested Kingfisher, Blue Peafowl, Wallcreeper, Bal-tailed Treecreeper, Himalayan Bulbul etc. You can also see some migratory birds flying here. It is an ideal place for bird watchers. Morni Hills is full of flora and fauna and home to variety of wildlife. It also houses a large fort. The fort is an interesting place visited by many tourists. There are many beautiful lakes near Morni hill. These lakes are known for its surrounding sceneries and are visited by many tourists. Mansa Devi Temple and Gurudwara Nada Sahib are other places of religious importance to be seen here. Morni Hills offers its tourists adventurous activities like trekking and hang gliding. There are many trekking trails in Morni Hills which gives adventurous tourists a thrilling experience. Trekking is also the best way to explore beautiful nature of Morni hills. Chandigarh Airport serves as the nearest airbase to Morni hills. The airport is well linked by several domestic flights to Amritsar, Delhi and other major cities of the country. Chandigarh railway station is closest railway station to Morni hills. It is well connected by trains to Delhi and other cities and towns of the Haryana state and the country. Many state run buses and other private vehicles are available to reach Morni Hills from Chandigarh and many other cities and towns of the state. Morni Hills is situated at the altitude of 3900 feet and has pleasant weather during winter. September to March is best time to visit Morni hills.